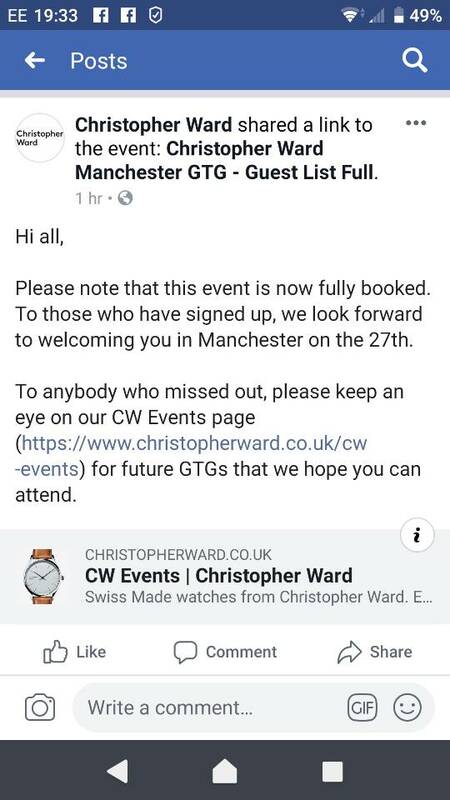 Appears to be a lot of interest in the GTG, remembering that the CWE Group and CW directly have been promoting the GTG as well. I need to get names of those attending to CW later today. I managed to get on, so would be cool to finally meet some of you! For those who will not be able to attend the GTG, as anticipated CW will be streaming the 'Chat with the Co-Founders' Live on YouTube. The Chat is due to start at 3:00pm BST and the link will go live shortly beforehand. Not long now, I hope everybody going has a great time. C60 Ombré #001/300, C7 Prototype, C11 Elite, C7 Bluebird, C70 Ascari, C7 COSC LE, C65 MK1 LE, C60 316L Yellow, C9-JH-MK3, C9-40-5DA, C600-IPB, C8-KVKT-MK2, C60-43-GMT-SWKS, C60-43-A-SKRS, C60-TI-V2, C8 UTC, C8 Flyer MK2, C65 Trident Diver, Rolex 912.